Carbon Fibre Pultruded Solid Round Rod, 1 metre Long. Pultruded carbon-fibre rods from HT carbon fibres (Torayca® T300 or equivalent) and epoxy resin are drawn continuously through a die. This production method causes the fibres to be oriented unidirectionally, i.e. along the length of the pultruded form. The result is a high fibre volume fraction of 62 % with a very low air voids content. A pre-treatment of the adherent is not nescessary. We do recommend to use epoxy resin or cyanacrylate (superglue) for the bonding itself. 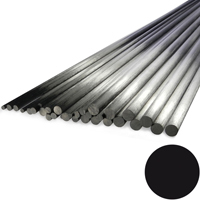 A range of carbon fibre rods, 1 metre long, in a selection of diameters from 0.5mm to 12mm outside diameter. Please see the cutting tools under tools for cutting the carbon fibre rods.